Remember the good ol’ days when just Big Brother kept tabs on what you did and where you went? These days, thanks to the proliferation of report-your-neighbor cellphone apps, a coworker, resentful ex-husband or that woman with the yappy Pomeranian who thinks you take too many photos at the dog park might be using their phone to quietly drop a dime on you. Thus ensuring that your local police department doesn’t miss a chance to decide if your afternoon stroll with Fido warrants further investigation. The widespread adoption of report-your-neighbor apps and other services by police departments makes reporting suspicious activity as easy as pushing a button. Depending on the apps’ capabilities, people can use them to anonymously report crimes in progress and to notify the authorities about vandalism and graffiti in their neighborhood. It’s the natural evolution, proponents say, of the ever ubiquitous “See Something, Say Something” campaigns that have littered our nation’s airports and subway stations since 2001. Similar to how most people don’t understand how tech giants like Facebook and Google use their data (or with which third parties they share it with), there are serious concerns whether the data being collected helps law enforcement connect the dots or simply creates an excessive number of dots that overwhelm and distract from more pressing developments. It’s not hard to envision scenarios where police officers spend hours evaluating thousands of bits of information that aren’t criminal or even require a response, but will still keep them marked in law enforcement databases. 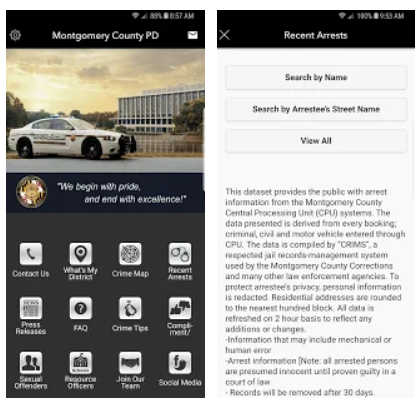 The app rolled out by police in Montgomery County, Maryland, which neighbors Washington, DC, is not intended to be used to report crimes or other emergencies, but it is intended to report anonymous tips and features a crime map where residents can see where crimes (and reports of alleged crimes) were committed and gives them the ability to use their cellphone to report on elementary school-aged children who might be acting suspiciously. In the days after its release, the names of people arrested (but not necessarily charged or convicted) were available to view on the app. The names and other personal information mysteriously vanished a few days later after it was discussed on a local police accountability listserv. It’s common for these apps to allow tipsters to remain anonymous, though their location and other personal information might be shared with local police simply by downloading or using the app. Becoming the neighborhood snitch is undesirable title, but without any kind of accountability it seems like these apps make it easy for nosey neighbors or anyone with a grudge to drag the police into their disputes. It’s also no surprise that these apps do not accept complaints about police misconduct. You have to do that in person or in writing, and in most cases, provide your real name and address. There is also limited supporting evidence that these apps help police. Typically released without adequate oversight, they lack basic transparency guidelines that would help educate the public about their effectiveness. While not as shadowy as the secretive non-disclosure agreements police departments sign with manufacturers of cell-site simulators like Stingrays to keep their usage hidden from public consumption, the dearth of publicly available data about these apps means their purpose and expense have yet to be justified. But what is known is downright troubling. Data from services like Nextdoor in Oakland and SketchFactor in New York show blatant signs of racial profiling. Other services indicate rampant privacy violations. A review of the data collected from BART Watch, an app created to assist riders on San Francisco’s Bay Area Rapid Transit system to report crimes, revealed that nearly 70 percent of reports involved black people even though they only make up about 10 percent of the entire systems’ ridership. Many other complaints were related to non-criminal activity like people sleeping on the trains or smelling bad. “We’re getting a lot of reports, and a lot don’t rise to the level of criminal activity,” acknowledged BART Deputy Chief Benson Fairow. BART and the maker of the app have also been sued because of privacy concerns over rider’s personal data. The spread of these apps and services is likely to continue. But just as with the proliferation of other law enforcement technology, there needs to be rules in place to ensure that they don’t violate basic privacy protections, and are actually doing what they claim to do. Otherwise, the only suspicious activity will be why we continue to allow them in our communities. Demand Accountability at the NSA! Tell the Intelligence Committees that you demand accountability and oversight of the NSA, and that you want them to protect Intelligence Community whistleblowers.